On the same South Texas beach pummeled by Hurricane Harvey this time last year, the Weeks family stretched out in the sand. Daughter Annabella, now 6, built sand castles while chattering away to her family. Alizabeth, now 2, collected seashells in the rolling tide. The baby of the family, Loralynn, born in the middle of the storm, smiled as the salty air brushed against her chubby cheeks. Add Hurricane Harvey as an interest to stay up to date on the latest Hurricane Harvey news, video, and analysis from ABC News. For their mother, Danielle Weeks, 2018 and 2017 couldn't be more different. A new home, a new baby, and a new outlook have all shaped their lives post-Harvey. 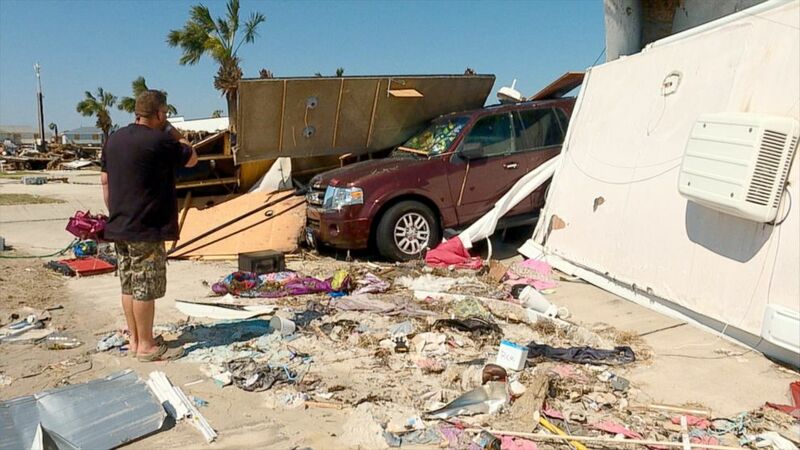 "We're doing really good since the hurricane," Danielle Weeks told ABC News. "Getting back on our feet. Couldn't really ask for anything more right now," her husband, William Weeks, added. "Everything's perfect." When Hurricane Harvey made landfall in the Corpus Christi area of Texas last year as a Category 4 storm, it ripped through towns with sustained winds of 130 miles per hour, destroying many of the buildings in its path. The area saw storm surges of up to 6 feet and substantial damage. The Weeks family became a part of the 70,000 Texans who were displaced by the storm. At the time, Danielle Weeks was nine months pregnant with Loralynn. In the days after Harvey made landfall, she and William would learn that they had lost their home and much of its contents while they also welcomed their new baby into the world. ABC News stayed with the Weeks family throughout the storm and as they struggled to rebuild their lives in its aftermath. William Weeks looks at the site of his destroyed home in Port Aransas, Texas five days after Hurricane Harvey made landfall. After a family-run construction business from Colorado heard about their plight on TV, they reached out to ABC News on Twitter about donating a tiny home they had built to the Weeks family. The couple, Steve and Candice Nelson, furnished the 300-square-foot house with donations from their church before driving it more than 1,000 miles to Corpus Christi to deliver it. "Thank you, thank you, thank you," William Weeks told the Nelsons on the day they met. "It means more to us than we can say in words," Danielle Weeks added, her voice cracking. 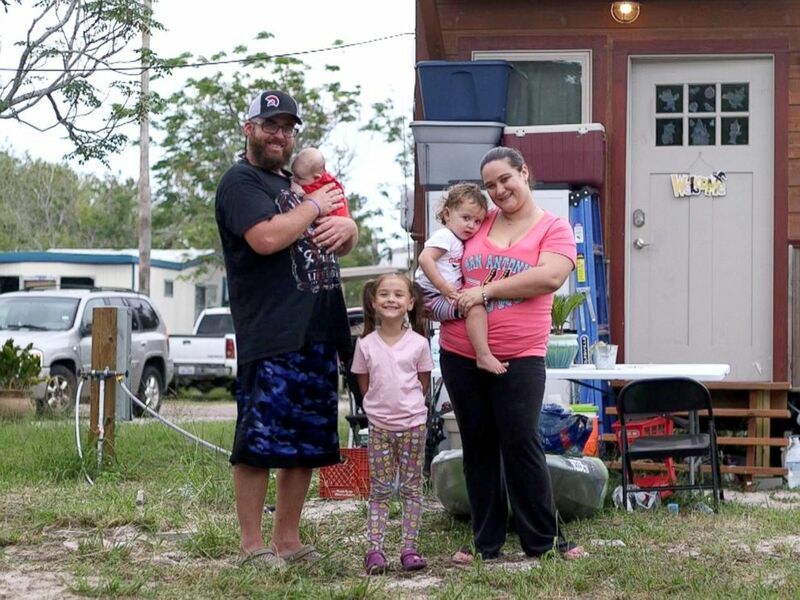 The Weeks family outside their new tiny home on October 31, 2017 in Corpus Christi, Texas. Now, on the anniversary of one of the costliest hurricanes in U.S. history, it's almost as if the Weeks' nightmare was a lifetime ago. William and Danielle Weeks both have new jobs at a local marina in Padre Island, Texas. As avid fishers, they both said their new careers have always been lifelong dreams. "Even though it stinks, this is like heaven to me. This is awesome!" William Weeks said, laughing about the fishy smell he endures while working in the marina's bait shop. The children are flourishing in their new life, according to both mom and dad. Annabella is on a local cheerleading team and starts first grade in the fall. Alizabeth is starting to practice her ABC’s and enjoys spending time with her little sister, Loralynn, whom she lovingly calls "Lola." Loralynn is crawling now and trying to climb things, too. "If we hadn’t had had the tiny home donated to us, we don’t know where we would be. We’re very grateful," Danielle Weeks said. "It got us through the most difficult time when we needed it the most." "It gave us that foundation that kept us together and let us move forward," William Weeks added. The family now lives in a condo near the beach, which was their dream. William Weeks also said the area around Corpus Christi, which depends in part on tourism, has made big strides in cleaning up the damage caused by Harvey. "They pretty much had all the gift shops up and running, and a lot of the restaurants too ... it was up and running by spring break," he said. "It’s pretty much still the condos they’re working on, personal homes." But it's not just the town that has changed in the year since Harvey, it's also the people who lived through it. "My biggest takeaway for the year after Harvey is don't take anything for granted," Danielle Weeks said. "You never know what could come up, or what you could lose, or who is most important to you." Sitting in the middle of her new home, her children's toys around her feet, she stopped to reflect. "Just don't take it for granted," she said.